I've been going to fusion fitness in Overland Park since late October. I'd heard about it from all the skinny hot moms on our block and figured it was the best place for me to go to get myself in shape and feeling great for the upcoming nuptials. I thought about taking a 'before' picture at the time, but I probably wouldn't share it with you anyway, so it doesn't matter that I didn't! You'll just have to trust me when I tell you it's worth it. The Stallion is a big fan, and I'd have him write a guest post about it, but that would just get weird. Have you heard of Kelly Ripa? Well, she goes to Physique 57 in NYC to keep herself in shape. Fusion is built on the same principles. Have you admired ballet dancers? Well, they look the way they do from doing Pilates. (Well, that and not eating) Fusion is built on the same principles (minus the not eating part). Do you wish you had a flatter tummy and smaller love handles? Fusion attacks those areas like the Allied troops on D Day. Are you about to get married and you want to look fabulous in your dress like I will? 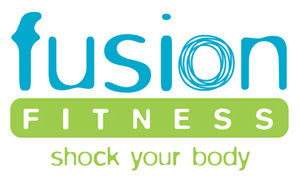 Fusion will kick your booty into shape in no time. They've even started a Bridal Bootcamp that focuses on the back and shoulders. My first class I almost threw up. I took that as a good sign. I hadn't been working out regularly, and that meant this program was something I could grow into and still be challenged every day. And really, I think I just pushed myself way too hard up front not knowing that I needed to pace myself in order to make it all the way through. One of my favorite things about this place is that it's fairly intimate. It's a studio, not a mega gym. You get to know the instructors and the regulars. I've been bouncing ideas off of a girl that I met there who just did her destination wedding - she's been a great resource. Right now, Fusion is running a promotion - they're going to draw from their facebook fans on May 1 for a $300 gift certificate. So, be sure to like their page and you're entered to win! Winning that would really get you on your way to becoming a Fusionista. (I just made that up) And if you're new to the whole concept of Pilates, I highly suggest you do one personal training session (which they're running a special for right now). All too often I see new people in class using improper form and I feel for them because they're not going to see the best results. The instructors do their best to ensure everyone is using the best form, but it's impossible to teach someone the foundational elements in a group setting. So, start with a private session. You can read about Fusion Fitness to your heart's content on their website. Then find your resolve, venture out to Overland Park, and get yourself into the best shape of your life. Just in time for that itsy, bitsy, teenie, weenie, yellow polka-dot bikini. Trampoline Enclosure around the Trampoline helps in providing extra security. The enclosure is made for safety purpose and not for climbing it or bouncing against it. Trampoline Enclosures are available in various shapes and sizes so that they can easily be attached to your Trampoline. It just takes a couple of hours to fix it and then your Trampoline Enclosure is ready. I like skipping rope and exercising regularly, but my friends suggested me to carry out trampoline exercises as well. Since, I was willing to choose the best trampoline for me, so I visited www.gettrampoline.com to get complete details.